What is a "Baroque violin"? Authenticity, labelling and compromise. The Baroque violin is strung in gut, occasionally using a metal wound G string. The modern violin uses a variety of materials for its strings, including various metals, plastics, and sometimes gut-core strings, but the plain gut string has been banished . The bridge took many different forms during the Baroque era, but in general it was much lower, somewhat thicker (especially at the top) and more “open” in design. Typical Baroque (1) and Modern (2) bridge designs. The Baroque neck runs approximately parallel to the table, whereas the modern neck is angled downwards. This is of course interdependent on the bridge height. This is much shorter on the Baroque violin. Bass bar This is generally smaller in a Baroque violin. bridge height, neck and fingerboard. 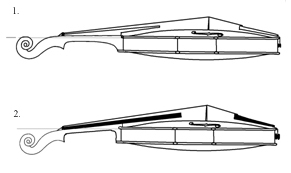 The essential features of the modern bow were first developed by Francois Tourte in the 1780s. Before this time the bow had taken a number of different forms, all of them shorter and lighter than the modern bow. A typical bow from the late 17th or early 18th century would be made from snakewood (a much stiffer, denser wood than pernambuco, used for later designs), have perhaps ¾ the length of a modern bow, half the amount of hair and a fixed frog. This made for a crisper articulation, increased agility and a greater variety of detached bow strokes. These factors combine to make a clear distinction between the “Baroque” and the “modern” designs. In the early days of experiments with period instruments, this was sufficient to make serious inroads into the use of period instruments to enhance musical understanding. The tonal, technical and expressive differences were plenty, and the fruits of these experiments could be seen in the vast flourishing of ensembles and recordings in the 70s, 80s and 90s. This flourishing, however, brought its own problems. As the idea of “authentic” performance caught the public imagination, it was gradually extended from its core of the high Baroque, backwards to the 17th century and forwards to the classical and early romantic periods. This was a very exciting time in the profession, as new repertoire was discovered and new approaches to familiar music inspired sparkling performances. For violinists this was an especially rewarding phase, as the violin repertoire of the 17th century proved to be a veritable gold mine. However, this fruitful period in history was, unsurprisingly, one in which many changes to the design of stringed instruments took place, in part inspired by musical developments. The implication of this is of course that the idea of one “Baroque” form of the violin from, say, 1600 to 1760, loses validity, and further classification becomes necessary. On the other hand, the distinctions have some validity and can be useful: the differences between Monteverdi’s and Mozart’s violins are substantial and significant. It is very difficult to play Mozart on a violin set up for Monteverdi, and while it is easier to play Monteverdi on a violin set up for Mozart, it is also (therefore) easy to lose sight of what is lost by doing so! This means that we need to study carefully the evolution of the violin – and to understand it as such. It is vital to recognize that we are not dealing with simple “progress” towards modern “perfection  ; instead we are looking at an instrument which has at each stage adapted to suit the prevailing musical style (and which in turn has influenced that style . In some ways this is very similar to Darwinian evolution: each species adapts to its environment but also influences that environment, creating a stable but flexible ecosystem. In short, while the features listed at the outset are no longer sufficient to define a baroque violin, the finer classification of renaissance, Baroque and classical is also problematic because of the fluid nature of the evolution of the violin. This has naturally put players in a difficult situation. It has long been believed that baroque string tension was lighter than that on a modern violin: recently, however, this has been shown to be largely false. For a detailed explanation of the principles of baroque stringing as currently understood, follow the link to strings. For example, we know that the wound G string became increasingly common on violins towards the middle of the 18th century, and we find that in the second half of the 18th century, composers were writing music that could ONLY be played with a wound G string. Similarly, the Tourte bow enabled or inspired composers to write in a different way, using slurs so long that a baroque bow would be useless.